Chris Hedges. Courtesy of Truthdig. And that is just his foreign policy. Corbyn says he will back significantly increasing taxes on the wealthy and ending the unfair tax breaks of corporations. He is for imposing safeguards to protect those on welfare and instituting a “maximum wage” for corporate executives in order to fight “grotesque levels of inequality.” He would install widespread rent control to stop what he calls “social cleansing” caused by gentrification. He has called on the Bank of England to carry out what he terms a “People’s Quantitative Easing,” demanding it invest billions in housing, energy and other infrastructure projects. He supports the creation of a sanctuary in the Antarctic to prevent mining and oil drilling there. He opposes fracking. He calls for government investment to build renewable energy based on solar and wind and “global regulation” to prevent the export of carbon products. And he would end the steps to privatize parts of his country’s universal health care system, known as the National Health Service. As Labour veered to the right and became dominated by corporate money and neoliberalism under Prime Ministers Tony Blair and Gordon Brown—a process also carried out by the Democratic Party under Bill Clinton and Barack Obama—Corbyn became a rebel in his own party. Between 1997 and 2010, as a member of Parliament, where he has held a seat since 1983, he voted against bills or challenged positions championed by the “new” Labour Party leadership more than 500 times. Blair, who detests Corbyn, warned that if Labour backs Corbyn in the next election for prime minister (which is set for 2020 but can be held anytime a no-confidence vote occurs in Parliament), it will face “annihilation” at the polls. Corbyn responded by suggesting that Blair should be prosecuted as a war criminal for his role in the 2003 invasion of Iraq. Mr. Corbyn sounds like a most interesting chap. If we deem the Democrats in USA as “the opposition party” (or [shudder] “the party of labor”! ), given the dominance of GOP over the past nearly 50 years–holding the White House for 7 of the dozen most recent 4-year election cycles and setting the nation on disastrous courses of perpetual war, infrastructure decay, environmental destruction and tax breaks for the rich–we have seen barely any resistance to these policies from the Dems who did attain the Oval Office during this period. The early success of Bernie Sanders will go down in history as but an interesting footnote to the elections of 2016. There is no way, even if he significantly dilutes his rhetoric, that he will get the nod to be the official Dem candidate. So, indeed, there is no one on the US political scene with an ability to get the public’s attention, given the marginalization of openly leftist groups, who could be considered comparable to Mr. Corbyn. Just another marker of the cultural impoverishment of a once vibrant nation. Agree. We desperately need new voices in America, Greg. Our politics is remarkably homogenized. For all the acrimony that resides on the surface, our politicians are basically in agreement when it comes to serving the moneyed interests and keeping weapons and wars rolling along. Oh, the heavy price of hammering out comments hurriedly! I had intended to include the ballooning US national debt on the list of Republican legacies. GOP candidates will all be pointing fingers at the incumbent administration as a prime offender in this arena in the coming 14 months, but of course Mr. Ronald Wilson Reagan ran wild with military related expenditures and Mr. George Walker Bush, following the orders of his boss Mr. Cheney, found convenient targets upon which to expend those munitions. We will never be able to know the exact number of human victims of these actions, and we needn’t hold our breaths awaiting a full accounting from the government of what this cost US taxpayers in dollars and cents. A round figure of a trillion dollars has been suggested for a minimum. I guess we may as well not worry about the cents, then, eh? ‘The current climate of Treasury value measurement methodologies (taken from practises used in the property market and elsewhere) to try to find mechanisms appropriate to calculating the value of visiting art galleries or the opera are a dangerous retreat into a callous commercialisation of every sphere of our lives.’ Corbyn here neatly describes the goats-sheep OS of both neo-liberal and classic conservative minds underlying global public policy lo these past 3.5 decades. “The discontent generated in backward countries by their contact with Western civilization is not primarily resentment against exploitation by domineering foreigners. It is rather the result of a crumbling or weakening of tribal solidarity and communal life. To endorse this view as applied to, say, Afghanistan today is NOT to automatically agree that “they” (the ungrateful colonial subjects) “hate us for our freedoms.” Mr. Hoffer says the motive for resentment is the disruption of a way of life that dates back centuries if not millennia. And what are these so-vaunted “freedoms,” anyway? The crucial ones, as empowered in the Bill of Rights of the US Constitution, are being whittled away day by day. Leaving us the freedom to be mindless consumers, basically. Now THERE’S something we should all be willing to fight and die for halfway around the globe, huh?!? And it must be added that the appeal of fundamentalist brands of religion is precisely the renunciation of individual responsibility and intellectual freedom of choice. If you participate in the fatal stoning of a woman accused of adultery, why you’re earning yourself passage to Paradise in the next world, you see? You are merely “following the rules” and are exempt from any need for remorse. Most peoples resent foreign interference, unless it’s of the humanitarian kind. People want to live their lives in time-honored ways. The USA has been far too heavy-handed in its interventions, and of course in some cases they’re simply invasions. Just think of how much we could help other peoples if: 1) We listened to them; 2) We helped them in ways they wanted to be helped. But no — we already know all the answers. And our biggest export is not democracy — it’s weaponry. And the ideology of the “free” market and rugged individualism. Well, the free market isn’t free, and rugged individualism only works in John Wayne movies. Or Rambo movies, the militarized version. Just finished reading Alfred McCoys “Grandmaster in the Great Game” piece on today’s tomgram. 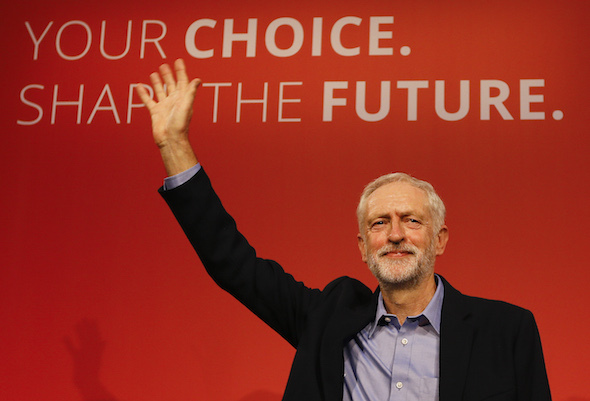 Corbyn’s political vision is much in line with Popular Resistance/Green Party goals and ideals. So are my own. They are attainable. If — a quite improbable IF — predators engaged in the Great Game swim uninterested elsewhere, and those types simly cannot do that. Perpetual, ruthless, ceaseless (don’t let occasional periods of comparitively low-scale activity fool you), predatory scheming and machinations and duplicity and assault and terror and subjugation and conquest and reaping of spoils is the seemingly inescapable trajectory of human behavior, with insufficient capacity to evaluate feedback from past results and sanely tune policy to correct course. It brings to mind the non-spiritual definition of karma: Karma is the process of experiencing the results of past actions while sewing the seeds of future experience. I’m amused by the pure terror shown by most of Britain’s media over Corbyn’s success. Good lord! with this man in charge the voters will actually have a choice between a left wing Labour party and the far right Tories! We can’t have actual CHOICE in a democracy! I suspect if Saunders wins the nomination the U.S. press will switch from studiously ignoring him to demonizing him. I’ve also noticed that for the most part the people of Britain have mostly been laughing at the ridiculous fear-mongering the media has been doing. I would honestly love to see the next U.S. presidential election come down to Saunders versus Trump. The power elites and mainstream media won’t know what to do. They love Trump as a traffic-generating clown but would be (rightly) terrified of him actually becoming president. I think their heads would explode if it came down to those two. I don’t think Saunders is perfect but he’s the only current option that won’t make me desperate for a way to leave Earth in a hurry if he wins. Silly Canadians! [wink] It’s Sanders, not Saunders! I trust that you’re aware the USA is awash in what we call wingnuts–rightwingers on the lunatic fringe, reveling in their crude ignorance. So we’re already hearing Bernie described as a “Socialist pig” and even a “Communist pig.” Yes, mild-mannered, white-haired ol’ Bernie. Of course Bernie poses about as much real threat to the Establishment here as Norman Thomas did in days of yore. He’s certainly no Eugene V. Debs, you get my drift? (Pardon my going back a century on that one. Younger folk may need to check Wikipedia on these gentlemen.) Here in the Incipient Police State of USA, any suggestion that perhaps governmental policies (i.e. foreign AND domestic) should encourage sharing the wealth a bit and relying more on diplomacy than military force are gonna be demonized, yes indeed. I highly, highly doubt the choice in November 2016 will be Bernie vs. ‘The Donald’ but in that case I would probably vote for Bernie rather than register a protest vote by choosing a third party candidate. This despite my having vowed to never again play the Lesser Evil Game! Whatever putrescence the GOP ends up with on the ballot, it won’t be superior to Trump, just a little less rude. That’s my bold prediction.